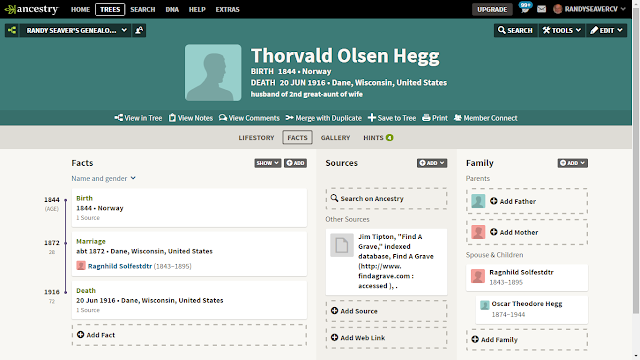 I wrote Good News: Ancestry Member Trees Indexes Were Updated on 29 August 2016 after Ancestry.com updated their Ancestry Member Tree Indexes for the first time since February 2016. In that blog post, I added spouses for the three daughters of Solfest Johannessen (1812-1845) and Anna Ellingsdtr (1812-1901), including source citations for their vital events. 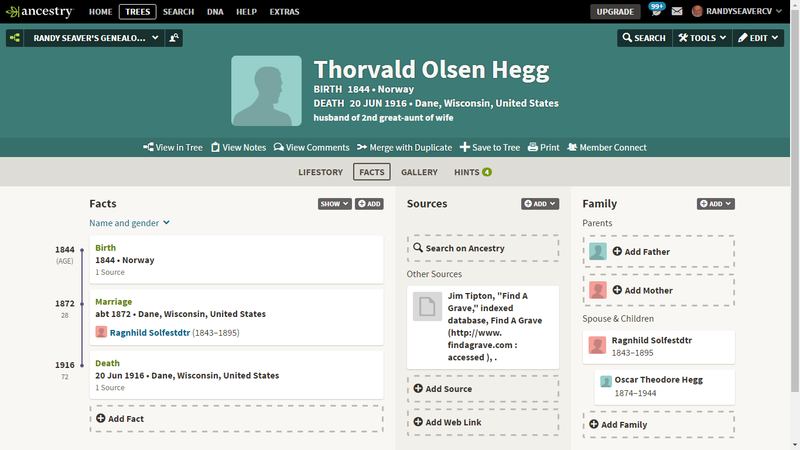 I asked the question: "How long will it take for Ancestry.com to update the Member Tree indexes? A week, a month, a year?" Several readers commented - one saying "a few months after you rattle their cage again." LOL! Well, we have an answer: It took about one month (I think). I admit that I forgot to check the index for the three spouses for several weeks in late September. When I looked on 1 October, there the three spouses were in the index. 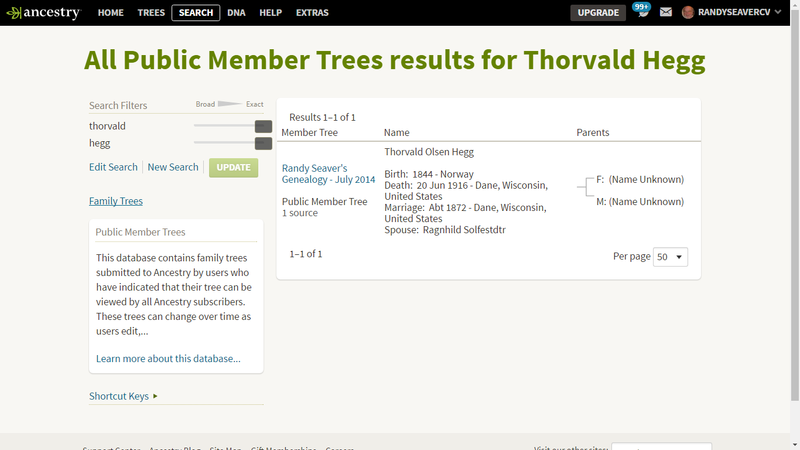 As you can see, there was only one match for this person, and it was the entry in my Ancestry Member Tree. 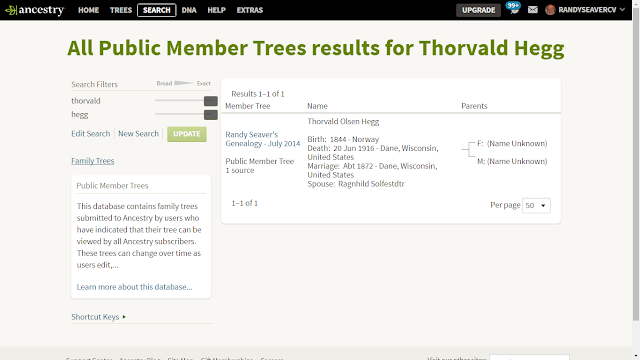 2) I went to the profile for Thorvald Olsen Hegg and added a child to the family - I added Oscar Theodore Hegg (1874-1944), and I added Oscar Hegg's wife also to this tree. Now we will see when Oscar Theodore Hegg is indexed in the Ancestry Member Tree. I'll bet it is by the end of October. I did not a source for the birth of his wife, but there is a source for their marriage. We will see if a search for Naomi Floberg (1878-????) turns up a match because of the marriage source. 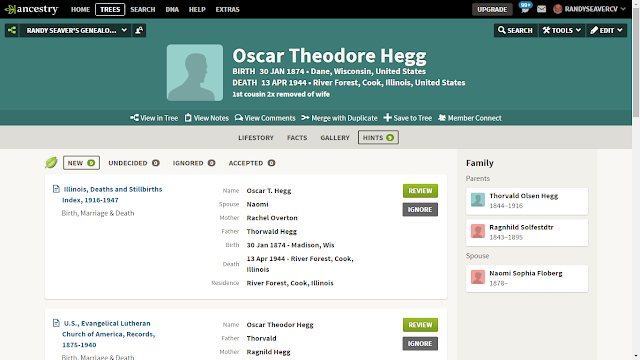 Note also that Ancestry provided the relationship of Oscar Theodore Hegg to me - the first cousin 2 times removed of wife." I like that extra information! 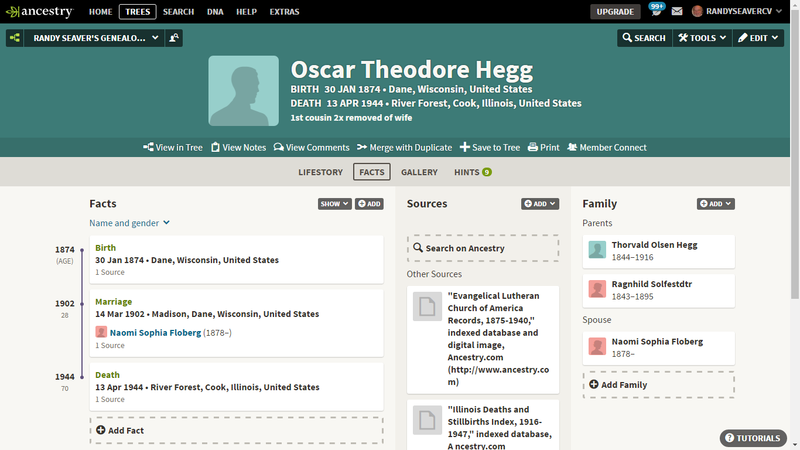 5) This is more good news - Ancestry.com indexed the Ancestry Member Trees without having their cage rattled. Let's see if they continue to be proactive with indexing the trees.